House may be earlier - very steep roof pitch, modern addition to side and rear. Fieldstones Restaurant 1937 - 1970. Themes - Architectural, Community Development and Recreation. Andover Advertiser, July 24, 1858 - "James Jaquith has made an addition to his house - 42 feet long; two stories high.." William Chickering, builder. House turned into restaurant, 1937. Proprietor was Sally Bodwell. Purchased by Order of Elks, who built large addition north end, altering original lines of house. This land, a 9 acre pasture, was purchased by James Jaquith, a Cordwainer, on Feb. 11, 1819 from Samuel Abbot Goldsmith who lived across the street. (Old Boston Turnpike or the Essex Turnpike) James Jaquith was born on Nov. 1, 1788 and married Phebe Goldsmith, sister of Samuel A. and daughter of Benjamin & Hannah Goldsmith. Phebe was born Oct. 4, 1793. The 1850 Andover Valuation schedule lists Jame's property as Dwelling House, barn and 9 acres adjoining $800. Farm stock $60. James & Phebe had twelve children: Phebe Goldsmith b.Mar. 29, 1814, Hannah Abbott b. Mar. 10, 1816, James Jr. b. Mar. 15, 1818, Mary b. Dec.5, 1819, Benjamin Franklin b. Feb. 14, 1822, Abigail "Abby" Ann b. June 28, 1824, Dorcas Jane b. Oct. 10, 1826, twins Henry and Henrietta b. May 15, 1829, Newton b. Oct. 9, 1831, Edwin b. Oct. 2, 1833, Ellen Crosby b. May 11, 1836 and Caroline Augusta b. Jan. 14, 1839. Caroline A. died of Scarlet Fever age 3 on Mar. 6, 1842. Typhus Fever would take four family members, daughters Abby Ann on Oct. 27, 1845, Dorcas Jane Nov. 29, 1845, Henrietta Dec. 2, 1845 and then their mother Phebe on Jan. 5, 1846. All are interred in the Jaquith lot at South Church Cemetery. James Jaquith died on Nov. 1, 1861 and his estate went to his surviving children. Son Newton was the Administrator and the estate was sold at auction on June 28, 1862 to brother Benjamin Franklin Jaquith of Boston for $1560. Benjamin then transferred the property into his wife's name Harriet A. Jaquith on July 6, 1865. The Homestead and 9 acres were then sold to Henry E. & Sarah E. Gould on April 6, 1867. Henry A. was baptized on Jan. 30, 1825 at South Church, son of Cornelius and Lydia Gould. Henry married Sarah Batchelder of Reading, MA int. Mar. 4, 1837. They had two sons, Theodore F. b. Mar. 20, 1846 and Mark b. April 3, 1849. Gould owned for 15 years then sold to Newton Jaquith, son of James, on Nov. 7, 1882. Newton born on Oct. 9, 1831 and married Laura Anne Greene b. 1837. Newton and Laura had three children: Laura b. 1860 - d. 1861, Mary Alice b. 1861 - Oct. 11, 1935 and Newton b. 1864 - d. 1941. Newton died on March 31, 1917 and his widow Laura inherited the estate. The 1920 Valuation lists House & Shed $1700., Barn $400., Carriage house $150, 9 acres $1500. 21 acres Woodland Scotland District $400. and a house at 14 Morton St.on 1/16 of and acre $1100. Laura died on Feb. 23, 1927 and her estate was given to her children; Mary Alice received 2/3 share and Newton 1/3 share of the homestead. They jointly held the property for ten years then sold to Sarah "Sally" Bodwell on March 13, 1937. 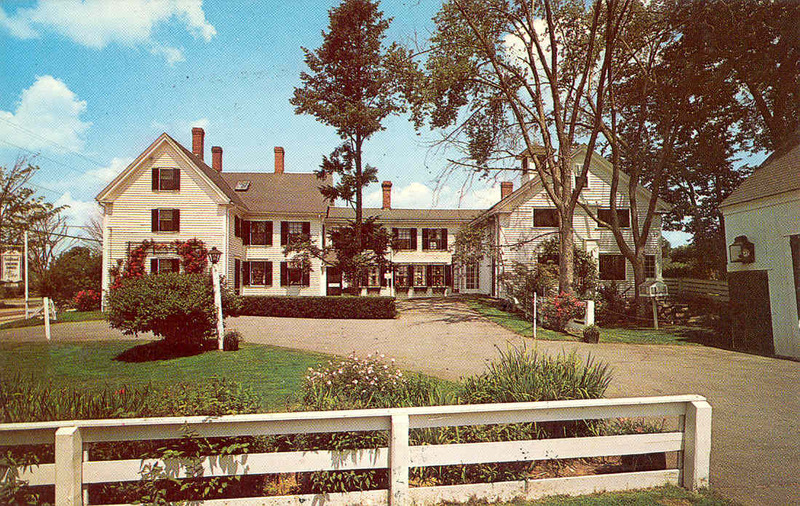 It was Sally Bodwell who converted the main house into a family restaurant named "Fieldstones". Sally later married C. Leon Houghton and lived in Whitinsville, Worcester Co. MA. In 1945 she sold the business to Wescott B. and Catherine M. Merrow of Boxford, MA. They owned a short time then sold Fieldstones back to Sally Houghton on May 4, 1946. The restaurant was purchased by Edward Romeo on March 1, 1960 who continued the business until 1970 when the restaurant closed. Romeo then sold the property to the Andover Lodge of Benevolent & Protective Order of Elks of USA, Inc. on Sept. 25, 1970. The Elks club added a large function hall addition to the north side of the home and converted the barn into a lounge room for members and their families. Their large lot to the rear was used to sell Christmas trees during the season and raise money for the charitable work. The Elks owned for 24 years at this location then selling on Nov. 22, 1994. The Andover Chapter later merger with the Lawrence Lodge on River Road. Nick-Mat Realty Trust purchased the property from the Elks and the following February 1995 the Historic homestead was razed for development of the Andover School of Montessori, Inc. which opened the school in 1996.